I can choose which it shall be. Yesterday is dead, tomorrow hasn’t arrived yet. I have just one day, today, and I’m going to be happy in it. was back to walking in the basement. At least I had some good outside walking days. just about a half mile from my house. It was a pretty day, sun shining and a bright blue sky. We drove out to Uniontown mid morning and spent the day there. so picked up the rest of the yarn for that. to brighten up the half bath. We had lunch while we were out too. It was a nice pleasant day. Pleasant - adj. Giving a sense of happy satisfactions or enjoyment. Hope your day was a happy one too. It does look like a nice day. Such a pretty place in the top photo. I have an elderly aunt who lives in Indiana and she has been trying to get her walks, but this last cold spell is too much for her as well. Such a cheery sunflower! Stay warm! Very pretty picture...thanks for sharing. Happy that you were able to get out of the house for a while and I love your sunflower.. very cheerful! ...10F is COLD. No painting makes for a good day. Sounds like a lovely day. I like the sunflower you bought...it goes perfectly in that bottle! You have some of the best scenery right by your house. It's late here, I read that as Unicorntown at first and was incredibly envious! Your surrounding countryside looks very similar to ours. 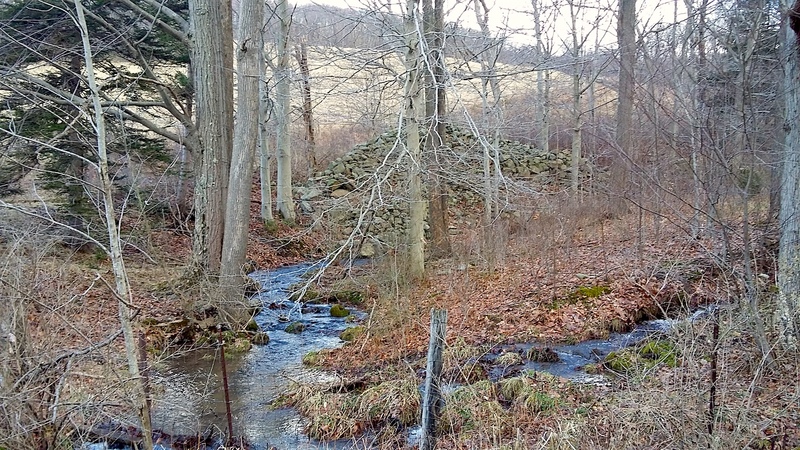 This little stream could well be the one here just east of our house. Sometimes it's good to just get out and about; kind of like hitting the refresh button. Hello, looks and sounds like a great day. I walked on my treadmill, it is too cold out there. Your sunflower is pretty. Happy Sunday, enjoy your day and new week. Hello, Dear Friend, so nice to visit again, we have been having beautiful warm temperatures here, 80, on Friday, it's been getting colder each day since. I really like the sunflower in the jar, such a nice adea!. I am certainly beginning to think spring, and have begun adding a few touches too! Sun flowers always make me smile. I know you are so enjoying your new home. That sunflower hits the spot. Beautiful. 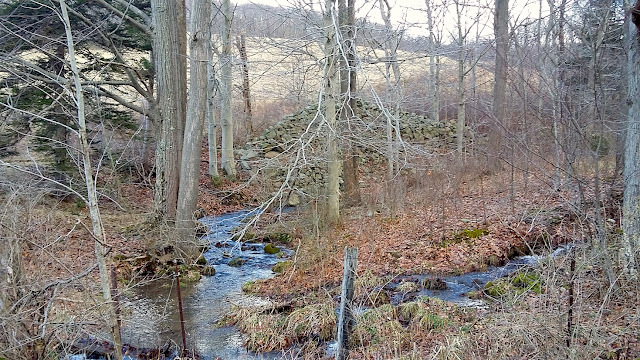 When I see very small trickles of water like that small creek, I like to think of it as the beginning of water going to the Chesapeake Bay. You are now pretty far from the Bay, but who knows. That creek is quite a welcome sight to see. I like the sunflower. Mine didn't grow this year. You're probably out on your walk right now! I hope to go later after I do my volunteer work. Enjoy your day! Sounds like a real enjoyable outing. 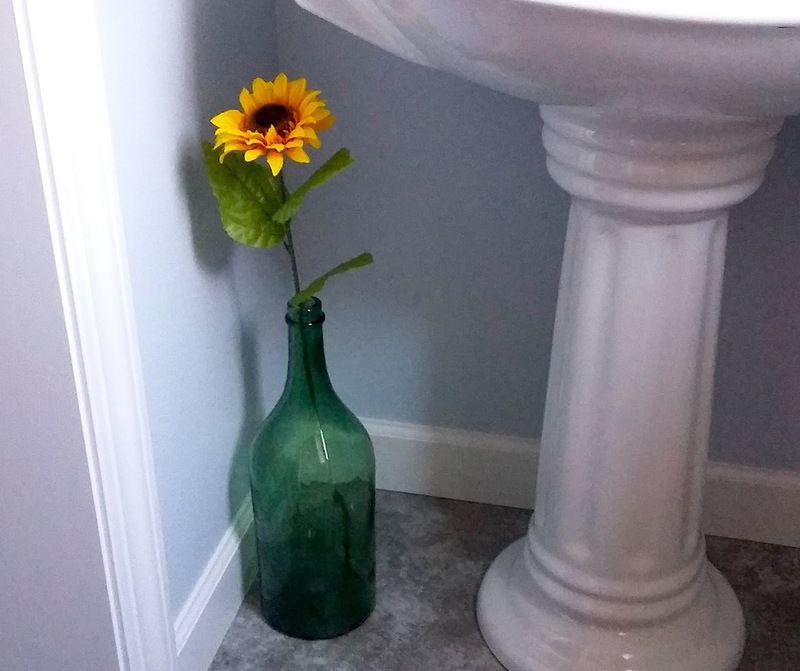 Love the sunflower in the powder room! OO -NSWR 18 CLASS Hornby Engine -Finished.